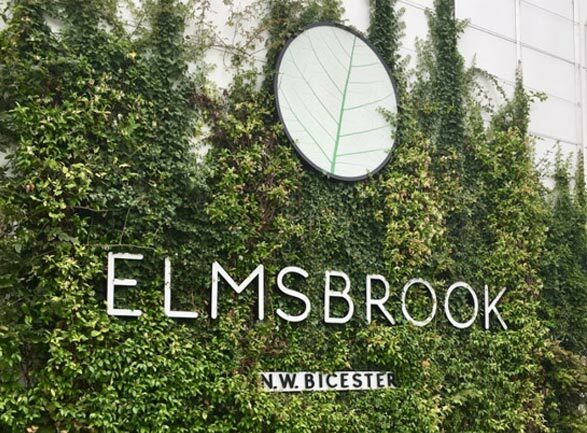 Elmsbrook at North West Bicester is the first phase of the UK’s first eco-town, a pioneering new development in the heart of the beautiful Oxfordshire countryside. Elmsbrook have been awarded with Bioregional’s One Planet Living status, one of only 11 recipients in the world to be recognised for this unprecedented standard of eco efficiency and sustainable living. Internationally renowned for their placemaking and innovative work on sustainability, the UK architects, Farrells, have been the firm behind this scheme’s design. Rather than a usual build process this scheme will be constructed using 30% less carbon to develop 393 zero carbon homes. Rainwater will be harvested for every home in order to reduce the amount of water used each day to just 80L per person. Solar panels will be placed onto the roofs of each home, totalling a surface area of 17,500 m2 across the scheme, making this one of the largest assemblies of solar panels in the UK, which will benefit the residents at Elmsbrook by contributing towards reducing their energy bills. A communication portal has been installed for the community at Elmsbrook. The ‘Shimmy’ (a home information system displayed on a tablet) will provide real time energy use, costs and bus travel times. With the aim to provide both a valuable and sustainable community that benefits its residents as well as the rest of Bicester, Elmsbrook will deliver a range of amenities suitable for all age groups. Some of these amenities include a primary school, local shop, nursery, cafes, community hall, an eco-business centre and an eco-pub. The larger picture for this Bicester development will offer 6,000 highly energy-efficient homes, 40% of which will be dedicated to green spaces encouraging a sustainable network of wildlife to flourish. The residents can enjoy a communal orchard, herb boxes on the streets, fruit bearing trees, allotments and children’s play areas. Every home will also receive a fruit tree in its garden. Elmsbrook has made accessibility to public transport as easy as possible, by placing bus stops within 400 meters of every home, which will ultimately reduce car use. Cycle paths will make it even easier to get around with routes connecting Elmsbrook to the rest of NW Bicester and the Town centre. In order to bring in other energy efficient forms of travel there will be an electric car club and each house will have the opportunity to install an electric car charging point. “Elmsbrook will be convincing proof that sustainable living doesn’t mean sacrificing comfort. We are creating a sustainable lifestyle here, which we hope will change perceptions and become the benchmark for future developments across the country. Residents at Elmsbrook will be able to enjoy the best of both the rural setting and the urban landscape. National transport links make it possible to get to London within 50 minutes, whereas Oxford is only 20 minutes away by car. Also just within 2 miles of the scheme is the Bicester Retail Outlet Village. Elmsbrook began its construction back in 2014 and the first residents are set to move in Spring 2016. 30% of Elmsbrook will be allocated to affordable rent and shared ownership. To discover more about Elmsbrook visit Elmsbrook.co.uk or contact FABRICA on 01869 691 000.